Personalized, Comfortable & Affordable Cosmetic Dental Care! Everybody loves to smile. But did you know that the act of smiling can actually improve your overall quality of life? It's true. However, many people are often embarrassed by the fact their teeth might not be 100 percent perfect. It is our goal at Mint Dentistry to help you achieve your best smile possible through the professional cosmetic dental services we offer at Mint Dentistry. Feel Good About Your Smile Again! 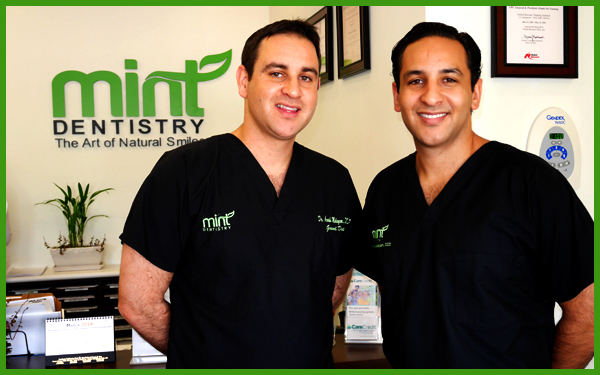 It is our mission at Mint Dentistry to provide each patient with personalized, comfortable and affordable dental care. This extends into the Cosmetic Dental Services we offer at our office. Our team of passionate and professional dental experts relies upon years of experience - combined with recent technological advancements in dental treatment, to provide exceptional dental care while still being environmentally responsible through revolutionary 'Green Dentistry' methods. The dentists at Mint Dentistry are committed to offering you a full range of cosmetic dental services to help you put your best smile forward. We will provide quality care and the most advanced techniques, affordably, with comfort and simplicity. To learn more about the specific cosmetic dental services we offer patients of Mint Dentistry, please click the above specific sections to explore our vast individual cosmetic dental service menu. If you have any questions about the quality-driven dental services we offer, or to set up an appointment, call us today @ 818-716-0297 – or simply fill out the CONTACT US FORM online. Mint Dentistry provides cosmetic dentistry services including veneers, implants, teeth whitening & more to residents of Woodland Hills, CA & surrounding areas including Encino, Sherman Oaks, Studio City, Tarzana & more.